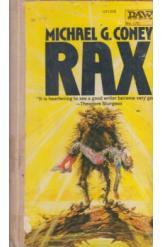 Rax by Michael G Coney, Sci Fi. Book is in good condition, all pages intact. Alika-Drove's seaside vacation is disrupted by the rise of the second sun Rax, which twists the world into one of chaos and brutal struggle. Alika-Drove must sacrifice either his innocence, or his life.